At the back of D4 there is a control panel consisting of buttons for device operation, a display for indicating current per cent brightness setting and current colour temperature expressed in kelvins, diodes signalling the operation mode, battery seats (optional) and mains power supply socket. Controllers of D4 lights have a non-volatile memory for three panel presets that include brightness and colour temperature settings. Calling the presets from individual memory units is done by pressing the related memory buttons; storing a preset requires holding the chosen button pressed for a while. Indicators found next to the buttons signal the use of memory. The optional DMX512 controller enables to control the light remotely in television studios or when the light is hard to reach. • Beautiful strong soft light. 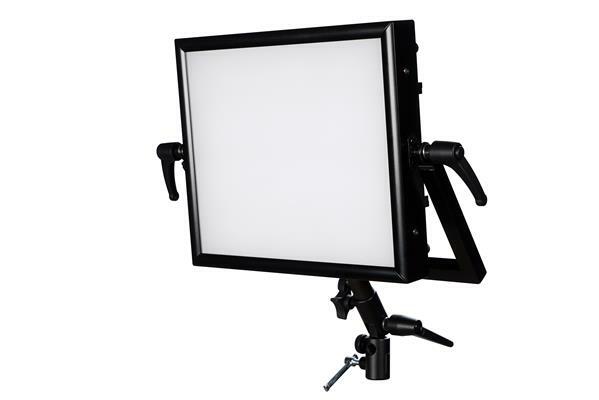 • No flickering effect, suitable for illuminating locations and sets filmed in slow motion at any frame rate. • Stepless colour temperature adjustment capability as well as switching between standard daylight and tungsten colour temperature settings. • Freely adjustable brightness (0–100%). • DMX512 signal control capability (option). • current colour temperature in K, per cent brightness, battery voltage. Non-volatile user settings memory. • Can be powered by common and inexpensive NP-F batteries or other camera batteries, including those of the V-Lock type. • High efficiency and low operating temperature. • Aluminum housing. Highly robust, resistant to shocks and moisture. • Dependability. Long service life. Intuitive operation.